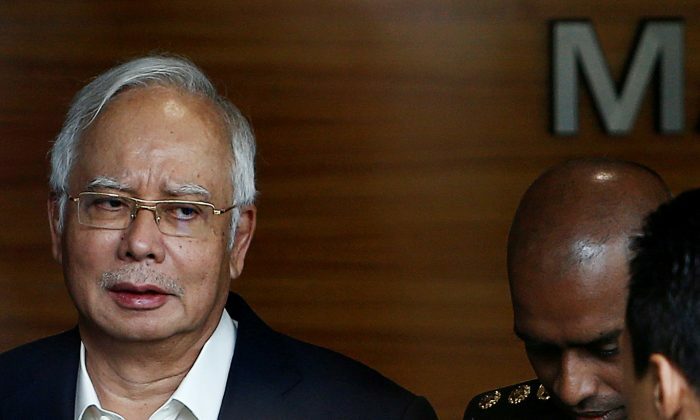 KUALA LUMPUR—Malaysian police said on Friday that cash worth 114 million ringgit (21.4 million pounds) and over 400 luxury handbags were seized from several apartments as part of an anti-graft probe into a state fund founded by former prime minister Najib Razak. At one empty apartment, officers found 35 bags stuffed with cash valued at 114 million ringgit. The banknotes were in 26 currencies, though the largest amounts were in ringgit and Singapore dollars. Singh said the empty apartment in Pavillion Residences, in the Bukit Bintang neighbourhood of Kuala Lumpur, did not belong to any of Najib’s family members. He declined to name the owner. Police also found 284 boxes of handbags in the apartment, and a further 150 handbags were seized from the home of Najib’s daughter, Nooryana Najwa, along with various shoes, including baby shoes. Najib concluded giving a statement to anti-graft agents on Thursday that was related to transactions of $10.6 million into his bank account that investigators had traced to a former unit of 1MDB. Najib, who led the country for almost a decade, has consistently denied any wrongdoing, having explained three years ago that $680 million transferred into his account had been a donation from an unnamed Saudi royal. In a separate development, Finance Minister Lim Guan Eng said in a tweet that he had asked tax authorities to investigate financier Low Taek Jho and his family as part of the 1MDB probe. Commonly referred to as Jho Low, the high-living 36-year-old was close to Najib’s family. His whereabouts are unknown. He has previously denied any wrongdoing, but the U.S. Department of Justice is seeking to seize his assets, including a $250 million superyacht that the department says was purchased with funds “stolen and embezzled” from 1MDB. Malaysia’s new government pledged on Friday to honour all payments on debt arising from 1MDB. It has estimated that government guarantees covered 38 billion ringgit ($9.54 billion) of 1MDB’s debt at the end of 2017. “We will honour those even though we are not happy with 1MDB, but we have to honour our international obligations,” Finance Minister Lim Guan Eng said. “I think this will reassure the markets that this government knows what it is doing”. Najib quit as president of UMNO a day after the election, and was replaced by his deputy Ahmad Zahid Hamidi. The UMNO statement noted that Mahathir had handed back 1.2 billion ringgit ($301 million) to the party and its 3 million members when he stepped down as party president in 2003.